Discount available! 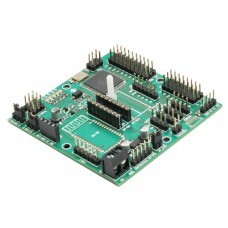 Recommend Board quadcopter Open Source to your friends and get your Discount. Board based on Arduino Mega, which allows you to manage the engines of a quadricottero, receive commands from a remote control for model aircraft and support the telemetry via smartphones. Besides all'Atmega 2560, programmed with open source firmware called MultiWii (allows you to control multicotteri, helicopters and airplanes), it has 8 outputs for engines, 8 inputs for standard RC receivers and compatible with PPM receivers, 4 serial ports for debug / Bluetooth module / OSD / GPS / telemetry, 3 servo outputs for the control of a gimbal system (pitch, roll, triggers), I²C bus to add sensors or devices, for GPS module connector, compatible with modules IMU GY-521, GY 86 and external connector for USB / serial converter FTDI, a supply stage 3.3V for additional devices and LEDs. The other critical element is the form IMU (Inertial Measurement Unit, which is the platform that detects acceleration, movements on three axes etc.) Available separately and can be inserted on the appropriate card connector. Both the card and the software support different flight phases: from simple model aircraft to multirotori. The preassembled board (SMD section only) does not include the IMU module, engines, propellers, etc. (see related products). PITCH: it represents the pitching, that is to say the oscillation on the transverse axis. ROLL: also said rolling, it is the term used to define the rotation of the model on its longitudinal axis. YAW: the movement around the yaw axis, that is to say the rotation of the model on its vertical axis. BLADE PITCH: it indicates the inclination of the propeller’s blade with respect to the rotation plane. 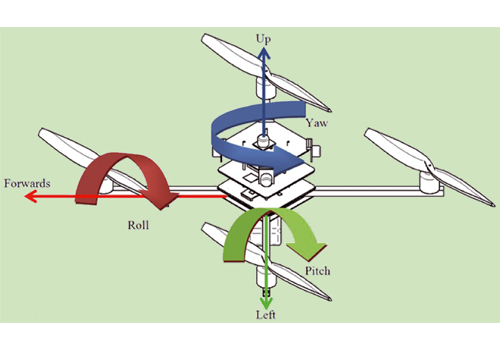 CLASS: it indicates the category the quadcopter belongs to, that is identified from the transverse distance between two engines (expressed in millimeters). ESC: the acronym of electronic speed controller, that is to say the power driver for the brushless engines. BEC: the acronym of battery eliminator circuit, it indicates that the ESC is supplied with an internal voltage regulator. PDB: the acronym of power distribution board, that is to say the printed circuit board that is used for bringing the battery power to all the ESCs. MODE2: the remote control’s usage mode, with gas and yaw and the left and pitch and roll on the right. MODE1: the remote control’s usage mode, with gas and yaw and the right and pitch and roll on the left. BIND: it indicates the association between the remote control and the receiver as in the RC radio equipment. PID: it indicates the triad formed by the proportional, integrative and derivative parameters of a control. If the card's microcontroller does not have a bootloader you must charge; the purpose you can use a dedicated programmer or simply an Arduino board acting as programmer functions. In the latter case refer to Table 2 to find out the connection required between the electronic card and ours. Then open the Arduino IDE and load the sample called ArduinoISP.ino sketched on the Arduino used as a programmer, then accessing to the Tools menu> type of Arduino set as target board "Arduino Mega 2560 or Mega ADK"; done what you set as a programmer Arduino (Tools> Programmer> Arduino as ISP) then start programming with the command Tools> Write Bootloader. A complete procedure (requires a few minutes) you disconnect the programmer and the board interfaced to a PC via the help of a USB / Serial converter connected to FDTI connector; your card will be seen as one of the Arduino IDE Arduino Mega board. It may happen that at the end of the procedure appears the error "avrdude: verification error, mismatch at first byte 0x1e000" rushed during the reading of the writings fuses, even if the writing procedure has been successful. in addition to the stabilization of the flight is to manage alarms, telemetry, location and much more, so we preferred to use an already existing software is completely open source and developed in recent years with the contribution of the net enthusiasts, called MultiWii . It allows you to control multicotteri, helicopters and airplanes; the reference site is www.multiwii.com (the Italian version is www.multiwii.it). The project was created using the gyroscope of the Nintendo Wii Motion Plus (the cheapest and easy to find at the time) and an Arduino mini pro card, but now supports a large number of sensors and adapters. The firmware is very light and can run on a small ATmega 328, but with all active functions (navigation and GPS), you must use an Atmega 2560. The software is managed in the repository https://code.google.com/p/ MultiWii /. By downloading the software package you have the software to Arduino and the GUI, written in Processing, to be run on the PC to manage settings and telemetry. The Arduino software only uses system libraries and therefore its use is immediate placing of only Arduino IDE. To configure the board and use the telemetry and mission planning, is also available WinGUI software and an application for Android smartphones. 1 Specification 1.1 Running current:20A(Output: Continuous 20A, Burst 25A up to 10 Secs..
Small card to quadcopter that allows you to make all power connections for ESC and battery. ..